He also has youtube channel where you can see some videos of the technique being used. And he is the author of three books that you can buy a real or digital copy of. His tambour beading and embroidery handbook is very helpful and is full of up close color pictures of the techniques. It is very helpful whether you are just learning or need a refresher course. I love using this technique because it is so fast that I feel like I can get a lot done, even if I only have a few minutes a day. Below is a picture of the embroidery that I completed in four days in Mr. Haven’s class. 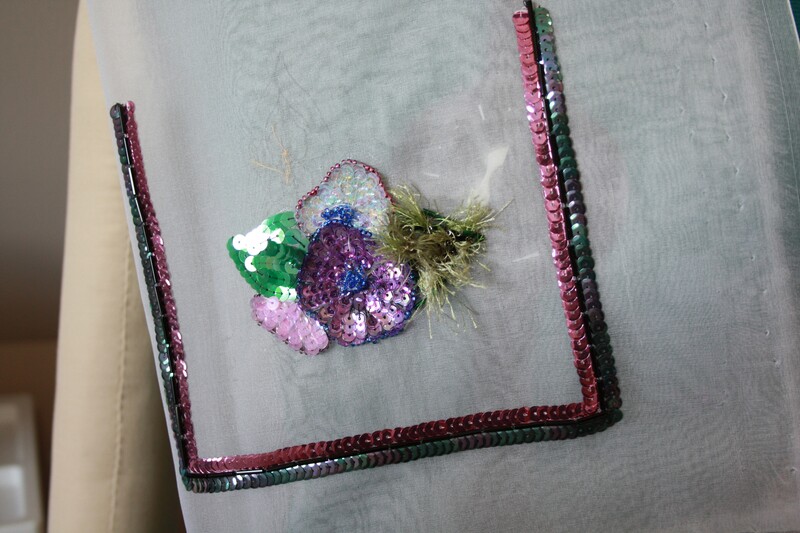 I also love doing this because it reminds me of all the Haute Couture embroidery in the French Couture Houses. Chanel and Dior to name just a couple. There work is so beautiful. It really is artwork. I have many many examples on my pinterest board that you can go check out. Finally I love tambour embroidery because like my sewing, weaving and designing, it is kind of a therapy for me. When everything just gets too hectic and I get stressed, I have a getaway that is soothing and distracting if only for a few minutes. Thanks for following along everyone. I will share more pictures of my Barn Owl soon. Although I am in the process of moving. So things will get a little crazy around my house for a while. But I will share more in a future post.